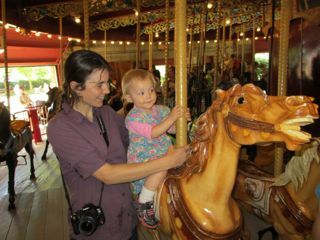 Last Friday, I took my granddaughter for her first carousel ride. The carousel is at Lakeside Park, which happens to be the “Miller’s Bay” park I had in my mind’s eye while writing Deep Cover and Shades of Truth. Of course, the landscape is quickly changing as a highrise is going in on the main street. But the antique carousel, carved in 1905 and brought to St. Catharines in 1921 is still going and continues to attract young and old alike. At a nickel a ride, it’s the best deal in town! 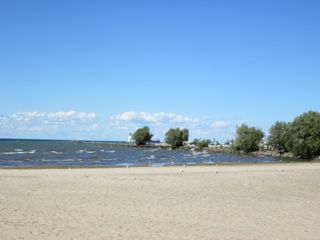 Lakeside Park is located on the shores of Lake Ontario near the mouth of the Welland Canal. 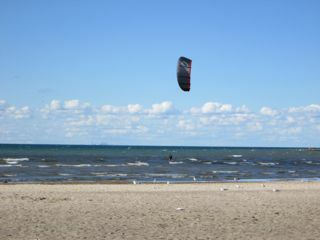 The area is home to the annual Henley Regatta and is becoming a popular spot for kite surfing. If you look closely at the horizon, a third of the way across from the left, you can see the skyline of Toronto across the lake. Your Turn: What do you enjoy doing on a day off?